The 2013 NBA draft was held on June 27, 2013, at Barclays Center in Brooklyn, New York. National Basketball Association (NBA) teams took turns selecting amateur U.S. college basketball players and other eligible players, including international players. The lottery took place on May 21, 2013. This was the first draft for New Orleans under their new Pelicans name after playing as the New Orleans Hornets previously. It would also be the last draft for the Charlotte Bobcats under their old name, as they went back to playing under their old Hornets moniker that they last used in 2002 once the 2013–14 NBA season was over. Anthony Bennett, the first pick, bounced around the league, and then was finally released by the Brooklyn Nets after averaging just 5.2 PPG. He is considered the most recent candidate of being named the worst #1 draft pick in recent memory, with next to no major media outlets even considering him a potential #1 pick up until the day of the draft. Highlights of the draft included the first Canadian number one selection (Anthony Bennett). The draft also included the first Canadian pair of lottery picks (Bennett and Kelly Olynyk), the first Iranian draft choice (Arsalan Kazemi), the first New Zealander first round pick (Steven Adams) and the last first round draft selections announced by then-NBA commissioner David Stern, the very last of which included a visit by Hakeem Olajuwon, Stern's first pick he ever announced back in 1984. He was replaced by current commissioner Adam Silver beginning with the 2014 NBA draft. 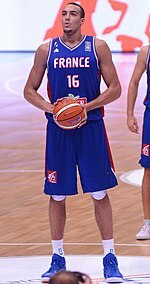 Steven Adams became the first New Zealander to be selected in the first round. He was the 12th pick by the Oklahoma City Thunder. Giannis Antetokounmpo was selected 15th by the Milwaukee Bucks. Rudy Gobert was selected 27th by the Denver Nuggets and was traded to the Utah Jazz. ^ Erik Murphy was born in France to an American father and a Finnish mother. He has dual U.S. and Finnish citizenship, but has chosen to represent Finland internationally. Robert Covington was undrafted, but went on to become a starter for the Philadelphia 76ers, and was later named to the NBA All-Defensive Team in 2018. These players were not selected in the 2013 NBA draft but have played at least one game in the NBA. The draft is conducted under the eligibility rules established in the league's new 2011 collective bargaining agreement (CBA) with its players union. The CBA that ended the 2011 lockout instituted no immediate changes to the draft, but called for a committee of owners and players to discuss future changes. As of 2012[update], the basic eligibility rules for the draft are listed below. All drafted players must be at least 19 years old during the calendar year of the draft. In terms of dates, players eligible for the 2013 draft must be born on or before December 31, 1994. Player who are not automatically eligible must declare their eligibility for the draft by notifying the NBA offices in writing no later than 60 days before the draft. For the 2013 draft, this date fell on April 28. Under NCAA rules, players will only have until April 16 to withdraw from the draft and maintain their college eligibility. Forty-five college players declared for the draft. Fifteen players who did not attend college in the US or Canada between the ages of 18 and 22 declared for the draft. They are least 22 years old during the calendar year of the draft. In terms of dates, players born on or before December 31, 1991, are automatically eligible for the 2013 draft. Below were the chances for each team to get specific picks in the 2013 draft lottery, rounded to three decimal places. ^ 1: Toronto Raptors' pick was conveyed to the Oklahoma City Thunder. The NBA annually invites around 10–15 players to sit in the so-called "green room", a special room set aside at the draft site for the invited players plus their families and agents. The following 13 players were invited (listed alphabetically) to the 2013 NBA draft. ^ a b On July 5, 2012, the Oklahoma City Thunder acquired the 2013 first round pick (the 12th pick), a 2013 second-round pick (the 32nd pick), a future top-20 protected 1st-round pick (from the Dallas Mavericks), Kevin Martin, and Jeremy Lamb from the Houston Rockets in exchange for James Harden, Cole Aldrich, Daequan Cook, and Lazar Hayward. Previously, on July 5, 2012, Houston acquired Gary Forbes and a 2013 first-round draft pick (the 12th pick) from the Toronto Raptors in exchange for Kyle Lowry. Previously, on July 20, 2012, Houston acquired JaJuan Johnson, E'Twaun Moore, Sean Williams and the 32nd pick from the Boston Celtics in a sign-and-trade deal involving Courtney Lee. Previously, on Jun 26, 2012, Oklahoma City was forced to give Boston the 32nd pick in compensation for Jeff Green's heart problems. Previously, on December 19, 2011, Oklahoma City acquired the 32nd pick from the Charlotte Bobcats in exchange for Byron Mullens. ^ On July 11, 2012, the Atlanta Hawks acquired the 2013 first round pick (the 18th pick) from the Brooklyn Nets as a part of Joe Johnson trade. Previously, on December 15, 2010, the Nets acquired Sasha Vujacic, and a conditional first-round draft pick from the Houston Rockets in a three-team trade. ^ a b On March 15, 2012, the Cleveland Cavaliers acquired Luke Walton, Jason Kapono, a conditional 2012 first round pick and the rights to swap the least favorable of 2013 first round picks in exchange for Ramon Sessions and Christian Eyenga. Cavaliers had their own pick (the 1st pick) and the Miami Heat's first round pick (the 30th pick), hence the option is exercised as Cavaliers received the Lakers' 19th pick and the Lakers received the Heat's 30th pick. Previously, on July 10, 2010, the Cavaliers received the 30th pick in a sign-and-trade deal with Miami for LeBron James. ^ On February 23, 2011, the Utah Jazz acquired Devin Harris, Derrick Favors, 2011 round pick and the 2013 first round pick (the 21st pick) from the Brooklyn Nets in exchange for Deron Williams. Previously, on July 22, 2008, the Nets acquired a conditional first-round draft pick (the 21st pick) from the Golden State Warriors in exchange for Marcus Williams. ^ On June 23, 2011, the Minnesota Timberwolves acquired Brad Miller, rights to Nikola Mirotić and Chandler Parsons and a 2013 first round pick (the 26th pick) from the Houston Rockets in exchange for Jonny Flynn, rights to Donatas Motiejūnas and a 2012 second-round pick. Previously, on February 24, 2011, the Rockets acquired Hasheem Thabeet, DeMarre Carroll and a 2013 first-round draft pick from the Memphis in exchange for Shane Battier and Ish Smith. ^ a b On June 11, 2012, the Phoenix Suns received the Los Angeles Lakers' 2013 first round pick (the 30th pick), a 2013 second round pick (the 57th pick), 2014 second round pick, and 2015 first round pick in a sign-and-trade deal for Steve Nash. Previously, on June 23, 2011, the Lakers acquired a future second round pick (the 57th pick) from the Denver Nuggets in exchange for the draft rights to Chukwudiebere Maduabum. ^ On June 24, 2011, the Cleveland Cavaliers acquired two future second round picks (including the 31st pick) from the Orlando Magic in exchange for Justin Harper. ^ On February 21, 2013, the Houston Rockets acquired the Phoenix Suns' 2013 second round pick (the 34th pick) in exchange for Marcus Morris. ^ On January 4, 2012, the Philadelphia 76ers acquired the Memphis Grizzlies' 2012 second round pick and the New Orleans Hornets' 2013 second round pick (the 35th pick) in a three team trade involving Marreese Speights. ^ a b On July 20, 2012, the Portland Trail Blazers acquired Sasha Pavlovic, the 39th pick and the 45th pick from the Boston Celtics in a three team sign-and-trade deal involving Courtney Lee. Previously, on February 24, 2011, Boston acquired the 39th pick from the Cleveland Cavaliers in exchange for Semih Erden and Luke Harangody. Previously, on July 27, 2010, Cleveland acquired the 39th pick from the Minnesota Timberwolves along with Ramon Sessions and Ryan Hollins in exchange for Delonte West and Sebastian Telfair. ^ On June 30, 2013, the Memphis Grizzlies acquired Ed Davis, José Calderón, and a 2013 second round pick (the 41st pick) from the Toronto Raptors in a four team trade involving Rudy Gay. Previously, on January 23, 2011, Toronto acquired Alexis Ajinca and the 41st pick from the Dallas Mavericks in exchange for the draft rights to Giorgos Printezis. This pick was reacquired from a 2010 draft deal in which Toronto sent this pick to Dallas in exchange for the draft rights to Solomon Alabi. ^ On August 10, 2012, the Orlando Magic acquired a 2013 second round pick (the 51st pick) from the Denver Nuggets in a four team trade involving Dwight Howard. Orlando also received draft picks in 2014, 2015, and 2017. ^ On June 23, 2011, the Minnesota Timberwolves acquired a 2013 second round pick (the 52nd pick) from the New Jersey Nets in exchange for the draft rights to Bojan Bogdanovic. ^ On December 10, 2011, the Washington Wizards acquired Ronny Turiaf, a 2012 second round pick from the Dallas Mavericks and a 2013 second round pick (the 54th pick) from the New York Knicks in a three-team trade involving Tyson Chandler. ^ On February 16, 2009, the Detroit Pistons acquired the Los Angeles Clippers' 2013 second round pick (the 56th pick) in exchange for Detroit's 2011 second round pick and Alex Acker. ^ On December 13, 2011, the Minnesota Timberwolves acquired Robert Vaden, a 2012 second round pick and a future conditional second round draft pick (the 59th pick) from the Oklahoma City Thunder in exchange for Lazar Hayward. ^ On February 21, 2013, Memphis acquired Dexter Pittman and the Miami Heat's 2013 second round pick (the 60th pick) in exchange for the draft rights to Ricky Sánchez. ^ a b The New Orleans Pelicans traded 6th pick Nerlens Noel and a 2014 protected first-round pick to the Philadelphia 76ers in exchange for Jrue Holiday and 42nd pick Pierre Jackson. ^ a b c The Minnesota Timberwolves traded 9th pick Trey Burke to the Utah Jazz in exchange for the 14th pick Shabazz Muhammad and the 21st pick Gorgui Dieng. ^ a b The Dallas Mavericks traded 13th pick Kelly Olynyk to the Boston Celtics in exchange for the draft rights to the 16th pick Lucas Nogueira and a pair of 2014 second-round picks. ^ a b c The Dallas Mavericks traded 16th pick Lucas Nogueira, guard Jared Cunningham and the No. 44 pick (Mike Muscala) to the Atlanta Hawks for the No. 18 pick, Shane Larkin. ^ a b The Minnesota Timberwolves traded 26th pick Andre Roberson and Malcolm Lee to the Golden State Warriors in exchange for a 2014 second-round pick and cash. Golden State then traded Roberson to the Oklahoma City Thunder in exchange for the 29th pick (Archie Goodwin) and cash. ^ a b The Denver Nuggets traded 27th pick Rudy Gobert to the Utah Jazz in exchange for the 46th pick, Erick Green, and cash. ^ a b The Golden State Warriors traded 29th pick Archie Goodwin and Malcolm Lee to the Phoenix Suns in exchange for 30th pick Nemanja Nedovic. ^ The Cleveland Cavaliers traded 31st pick Allen Crabbe to the Portland Trail Blazers for two future second round picks. ^ a b c The Philadelphia 76ers traded 35th pick Glen Rice Jr. to the Washington Wizards in exchange for 38th pick Nate Wolters and 54th pick Arsalan Kazemi. ^ a b The Philadelphia 76ers traded 38th pick Nate Wolters to the Milwaukee Bucks in exchange for 43rd pick Ricky Ledo and a future second round draft pick. ^ The Portland Trail Blazers traded 40th pick Grant Jerrett to the Oklahoma City Thunder for cash. ^ The Philadelphia 76ers traded 43rd pick Ricky Ledo to the Dallas Mavericks in exchange for a 2014 second round pick (Boston's 2014 pick in the Kelly Olynyk-Lucas Nogueira trade). ^ The Atlanta Hawks traded 50th pick James Ennis to the Miami Heat for a future second-round pick. ^ The Indiana Pacers traded 53rd pick Colton Iverson to the Boston Celtics for cash. ^ The Memphis Grizzlies traded Darrell Arthur and 55th pick Joffrey Lauvergne to the Nuggets for Kosta Koufos. ^ "2013 NBA Draft will be held in Brooklyn at the Barclays Center". CBS Sports. Retrieved 24 April 2013. ^ a b c d e f g h i j k l m "Nerlens Noel heading to Philly". ESPN.com. 2013-06-28. Retrieved 2013-06-28. ^ "Revisiting the Kyle Lowry Trade". RaptorRepublic.com. 2013-05-23. Retrieved 2013-06-27. ^ a b "Celtics Acquire Lee". NBA.com. ^ Adrian Wojnarowski (Jun 26, 2012). "Thunder forced to give up draft pick to Celtics as compensation for Jeff Green's health issues". Yahoo! Sports. ^ "Thunder deal Byron Mullens to Bobcats". ESPN. December 19, 2011. ^ "Brooklyn Nets Acquire All-Star Joe Johnson". NBA.com. 2012-06-26. Retrieved 2013-04-18. ^ "NETS Acquire Vujacic & Two 1st-Round Picks in 3-Team Trade". NBA.com. 2010-12-15. Retrieved 2013-04-18. ^ "Cavaliers Acquire 2012 First Round Pick, Kapono, Walton And Right To Swap 2013 First Round Picks From Lakers". NBA.com. 2012-03-15. Retrieved 2013-04-18. ^ "Jazz Obtains Harris and Favors from New Jersey". NBA.com. 2011-02-23. Retrieved 2013-04-18. ^ "Warriors Acquire Guard Marcus Williams From New Jersey". NBA.com. 2008-07-22. Retrieved 2013-04-18. ^ "Wolves Complete Five Draft-Night Trades". NBA.com. 2011-06-23. Retrieved 2013-04-18. ^ "Rockets Deal For Thabeet, Dragic And Carroll". NBA.com. 2011-02-24. Retrieved 2013-04-18. ^ Marc Stein (July 5, 2012). "Steve Nash headed to Lakers". ESPN. ^ "Nuggets acquire rights to Nigerian forward from Lakers". NBA.com. Turner Sports Interactive, Inc. June 23, 2011. Retrieved June 28, 2011. ^ "Magic make a trade, selection on draft night". NBA.com. June 24, 2011. Archived from the original on June 27, 2011. ^ "Marcus Morris traded to Suns". ESPN. February 21, 2013. ^ Marc Stein (January 4, 2012). "Grizzlies acquire Marreese Speights". ESPN. ^ "Update: Bucks get point guard Nick Wolters in trade for second round pick Ricky Ledo". Wisconsin State Journal. June 28, 2013. ^ "Cavaliers Acquire Erden and Harangody from Boston for Future Second Round Pick". NBA.com. February 24, 2011. ^ "Wolves trade Sessions to Cavaliers". ESPN. July 27, 2010. ^ "Rudy Gay traded to Raptors". ESPN. January 31, 2013. ^ "Raptors Acquire Ajinca, Draft Pick And Cash Considerations From Dallas". NBA.com. January 24, 2011. ^ "Mavericks officially secure rights to Ricky Ledo in trade with 76ers". Dallas Morning News. June 28, 2013. ^ Smith, Sam (March 19, 2014). "Bulls' Murphy excited to join Finnish national team". NBA.com. Retrieved June 29, 2014. ^ "It's official: Howard dealt to Lakers in four-team trade". NBA.com. August 10, 2012. Archived from the original on August 11, 2012. ^ "NETS Acquire Draft Rights to Bojan Bogdanovic". NBA.com. June 24, 2011. ^ "Wizards Acquire Turiaf". NBA.com. December 10, 2011. ^ "Clippers Acquire Alex Acker From Detroit Pistons". NBA.com. February 16, 2009. ^ "Grizzlies acquire Dexter Pittman". ESPN. 2013-02-21. Retrieved 2013-06-27. ^ a b "NBA early entry applicants list release". USA Today. May 1, 2013. Retrieved 2013-05-03. ^ a b "Eighteen early-entry candidates withdraw from 2013 Draft". NBA.com. Jun 18, 2013. Retrieved Apr 21, 2016. ^ "D-League stop helps college washout revive his NBA dream". NBA.com. 2013-05-14. Retrieved 2015-05-08. ^ "2013 NBA Draft Pick Pending Transactions". Prosportstransactions.com. Retrieved 2013-06-27. ^ Golliver, Ben. "Reports: 13 prospects receive NBA Draft green room invitations | The Point Forward — SI.com". Nba.si.com. Archived from the original on 2013-06-30. Retrieved 2013-06-27.